Yoga has allowed Louis to experience vast empowerment and profound healing in both body and mind. He teaches a fluid vinyasa that encourages exploration, as well as yin, the yoga of deep restoration. Louis is deeply passionate about living his best self. He believes in and encourages living in vitality and clarity every single day. Louis became a yoga teacher in 2014 and had been immersed in learning ever since. He is inspired by Nicole Walsh, Rod Galbraith and Mel McLaughlin. 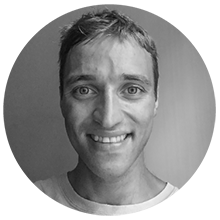 Louis draws from his honours degree in Psychology and Philosophy, and his continuing success as an endurance triathlete. Louis believes we can fall in love with every moment when we pay attention. Louis gets excited by both the heating and the cooling aspects of yoga, and how these energies work to create intimate self-expression.